The meme links to an article over at ‘Natural Cures Not Medicine' (here). The article contains very little scientific material and quite obviously is written to scare people out of buying foods with TSP, not present an objective viewpoint on it. The article states that TSP is something that developers and construction workers should be familiar with, not people buying food (a pretty pointless comparison). The authors of the natural cures article go so far to even say that inorganic phosphate can be detrimental to our health: there is no citation for this claim, which is a rather ludicrous one seeing as almost all of the phosphorus in the body's extracellular fluids is in an inorganic form. Organic phosphorus simply refers to when phosphate is found in a complex with carbon-containing materials, like phytic acid in plants or nucleic acids in our body, rather than in an ionic state (1,2). Note that this issue of TSP in our food is a pretty widespread target for pseudoscience-activists. A youtube video from health conspiracy covered it. Seattle Organic Restaurants misrepresent the TSP story. Activistpost covered it. And the Natural Society, too. The list could go on, but it seems like there is widespread fear being spread about this ingredient. So what is Trisodium Phosphate? : Trisodium phosphate is simply a sodium salt of phosphoric acid. It contains 3 sodiums, and a phosphoric acid ( an antioxidant and flavoring agent commonly added to food that does not provide unique safety concerns apart from total phosphorus intake (3)). It adds the essential minerals sodium and phosphorus to the diet (things most Americans are not deficient in). What is its role in Food? : It is widely used as an emulsifier and stabilizer in food (4). It can also be added as an antimicrobial agent (5). Is it toxic? : Yes, virtually everything is toxic at a specific dose. Is it safe? Yes. The joint FAO/WHO (Food and Agriculture Organization, World Health Organization) statement on trisodium phosphate as a food additive set the maximum tolerable daily intake (MTDI) at 70mg/kg of bw (6) - this was a grouped MTDI for all phosphorus containing additives, not just trisodium phosphate. This is because their is no unique health concern related to TSP. The U.S. Food and Drug Administration has given TSP the Generally Recognized as Safe designation (7). The EU has also approved sodium phosphates, including trisodium phosphate, for use as a food additive (8). The concern raised by Organic Health and the other sites I mentioned are due to the conflation of TSP's role as a food additive with its role in industrial uses. There is a huge difference between concerns over the few milligrams consumed in food and the large doses that may be accidentally consumed/inhaled in industrial uses. The concerns raised by naturalcuresnotmedicine are analogous to someone saying don't add a few milligrams of sodium on your food because consuming several cups of it could kill you. Context matters. Is it a paint thinner? Paint thinner is just a general term used for a solvent used to thin paints and allow for easy clean up or removal. Paint thinners are commonly thought of as toxic or deadly because they contain large doses of strong solvents like acetone or mineral spirits, that, if ingested, can be deadly. TSP can be used a heavy duty cleaner, with a number of applications including wall cleaning, but it is not a paint thinner in the sense that one thinks about paint thinner as being made of acetone (note: even acetone can be made in the body; the fear over it is dose-dependent, like every other chemical). The TSP used in the picture above, when compared to Lucky Charms, is made by Savogran. Note that all of their applications require ¼ cup to 1 cup of TSP dissolved in water, not the few milligrams found in foods. Anyone who compares TSP to paint thinner has a severe misunderstanding of chemistry and is selling their paradigm with fear, not science or evidence. Other points: Sodium phosphates, including TSP, have caused some to be concerned because they add to our total intake of phosphorus (the reason that the WHO set the MTDI for phosphate additives, not just TSP). Phosphorus containing additives may contribute substantially to total phosphorus intake, depending on the individuals diet, and make it difficult for sub-populations, like kidney disease patients, to limit phosphate intake (9). The naturalcuresnotmedicine article lists concerns over TSP (again, they conflate the concerns over industrial uses and the small amounts in food), citing reduction of bone density. Some have expressed concern that those consuming high phosphorus diets that are low in calcium may impair calcium homeostasis and negatively impact bone density via a FGF23 dependent mechanism (10,11). If you're concerned about extra phosphorus from food additives, you can limit your consumption of them - they are often found in foods that are minimally nutritious, and shouldn't make up a bulk of your diet to begin with. Note that additives should not be the only thing on your radar then, as animal foods are also high in bioavailable phosphorus. Sodium phosphate solutions have also been used prior to colonscopies to cleanse the colon, and have caused some concern due to acute renal failure in a small percentage of users. These kind of comparisons ('X' is in my food but is also in 'Y' non-food substance) do nothing to address safety concerns over foods or food additives. 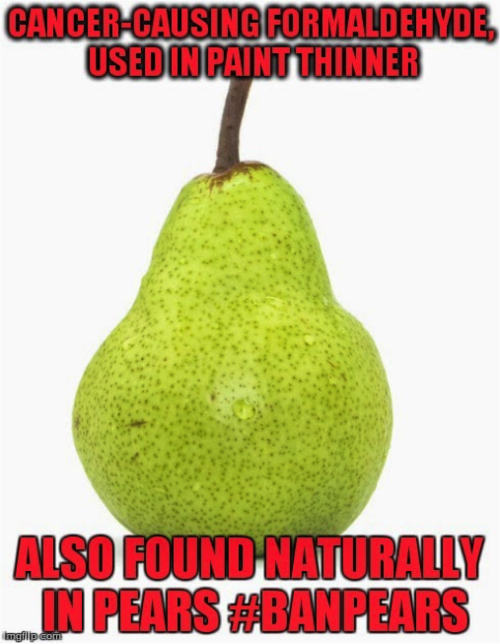 I could make you a thousand memes showing that formaldehyde is used in everything from wood finishing to paint, but that wouldn't make you not eat pears because they contain a small amount of formaldehyde, would it?